If Dun Meng wasn’t so dang responsible, he would have never fallen into the clutches of the Tsarnaev brothers, four days after they bombed the Boston Marathon finish line. But if he wasn’t so resourceful, the brothers would have gone on to do worse. He had had a long day at the office, so he climbed into his Mercedes-Benz ML350 SUV and drove along the Charles River to relax. He had turned left, over the BU Bridge, into Boston, and headed onto Brighton Avenue when a friend texted him. Rather than do what just about everybody else would do — text while driving — 28-year-old Dun Meng pulled over. Steve Mellin, the prosecutor, asked why he stopped the car. Dzhokhar Tsarnaev and his now-deceased brother, Tamerlan, allegedly set off explosives at the Boston Marathon. “I’m a transportation engineer, so I feel it’s unsafe,” Dun Meng replied. Almost as soon as he pulled over, a green sedan stopped right behind him. He thought it was odd how fast it showed up. A guy got out of the passenger side and approached Dun Meng’s passenger side. Dun Meng figured he wanted directions, so he rolled down the window. It was Tamerlan Tsarnaev, just minutes after he had assassinated MIT Police Officer Sean Collier. He reached in through the window, opened the door and jumped right in the passenger seat. Tsarnaev demanded money. Dun Meng gave him what he had in his pockets, about 45 bucks. Tsarnaev asked for his wallet and was not happy to see it was empty. As Tsarnaev handed back the empty wallet, he popped the magazine out of the gun, to show it was full of bullets. “You know I’m serious, so don’t be stupid,” Tamerlan Tsarnaev warned. Tsarnaev asked him whether he knew about the Boston Marathon bombing, and did he know who did it. “I did it,” Tamerlan Tsarnaev said, answering his own question. For good measure, he said he had just killed a police officer in Cambridge. Dun Meng thought to himself: The whole world is looking for this guy, and he’s sitting in my front passenger seat. Tsarnaev told him to drive. Dun Meng gripped the steering wheel with shaking hands. When Tsarnaev asked him where he was from and what was his name, Dun Meng said he was from China but decided to tell him one of his English nicknames: Manny. But, with his accent, it came out as Money. “You must have a lot of money,” Tamerlan Tsarnaev told him. “Chinese are friendly to Muslims,” he told Tamerlan. They drove into Watertown and Tamerlan Tsarnaev asked him whether he thought all white people look alike. 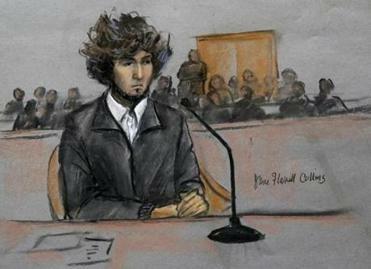 “So you won’t remember my face?” Tsarnaev asked. “I won’t remember anything,” Dun Meng told him. Tsarnaev told him to pull over on Dexter Avenue in Watertown, and that green sedan pulled in behind him again. Tamerlan ordered him to move from the driver’s seat to the front passenger seat. Dun Meng thought about running off, but the surroundings weren’t right. Tamerlan was joined by his younger brother Dzhokhar, and they began transferring into the Mercedes the homemade bombs they would hurl at the police who cornered them later that night. Tamerlan took the wheel. Dzhokhar got in the back seat, right behind Dun Meng. Can you point him out, Steve Mellin asked. “That gentleman over there,” Dun Meng said, pointing to Dzhokhar Tsarnaev, seated at the defendant’s table less than 10 feet away. Dzhokhar used Dun Meng’s ATM card to withdraw $800. As Dzhokhar was making the withdrawal in Watertown, Dun Meng thought about running again. But Tamerlan had told him they both had guns. They kept driving, and Tamerlan suddenly asked whether the lease allowed him to take the car out of state. “Like New York,” Tamerlan said. Tamerlan asked whether he had GPS in the car. Dun Meng lied and said no. In fact, the car was equipped with a state-of-the-art tracking system. He was starting to think down the road. They needed gas, but the first service station they pulled into was closed. They headed back to Watertown, to the green Honda, and Dzhokhar retrieved a CD from it and popped it in the SUV’s player. Dun Meng had never heard music like it before. The music made him nervous. Then they turned down a dark, dead-end street and that really made him nervous. But the moment passed and they drove on. Dun Meng’s roommate called but he didn’t answer. Then the worried roommate sent a text. Tamerlan looked at the text, but it was in Mandarin. Then his roommate’s boyfriend called. Tamerlan put the gun to Dun Meng’s head and told him to answer the call. Tamerlan was excited as they drove up Soldiers Field Road and saw lights on a gas station across the river, in Cambridge. They pulled into the Shell station at the corner of Memorial Drive and River Street. Dzhokhar tried to use the credit card again, but came back and said it was cash only. He was wrong. He misinterpreted the pump instructions about cash transactions. Tamerlan told his younger brother to put 50 bucks of Super in. Dzhokhar walked into the station’s store and began loading up on junk food for a road trip to New York: candy bars, Doritos, Red Bull. Dun Meng decided the conditions were finally right. Dzhokhar was in the store. Tamerlan had put the gun aside and had both hands on a Garmin GPS he had retrieved from the Honda. Dun Meng sighed heavily as he described that moment of decision. In his head, he counted down. And then he bolted. He felt Tamerlan grab at him as he got out of the Mercedes. And he heard him yell a word as he raced away. Dun Meng said the F word. “Can I speak that?” he asked. “You’ve done it now,” Mellin replied. It was a light moment in an otherwise heavy couple of hours. We knew the bulk of this story, from the extraordinary interview Dun Meng had given my colleague Eric Moskowitz in the days after it unfolded. But to hear it out of Meng’s own mouth, in halting English, was mesmerizing. What we didn’t know, and saw on video, was Tamerlan running into the Shell store after Dun Meng bolted. He told his brother they had to leave. Dzhokhar was backing out of the store with his arms still full of junk food when the clerk pointed out he hadn’t paid. Dzhokhar dutifully went to the counter and emptied his arms. The Tsarnaev brothers had killed three people at the Marathon, maimed many more, murdered a cop in cold blood, but they didn’t steal the junk food.